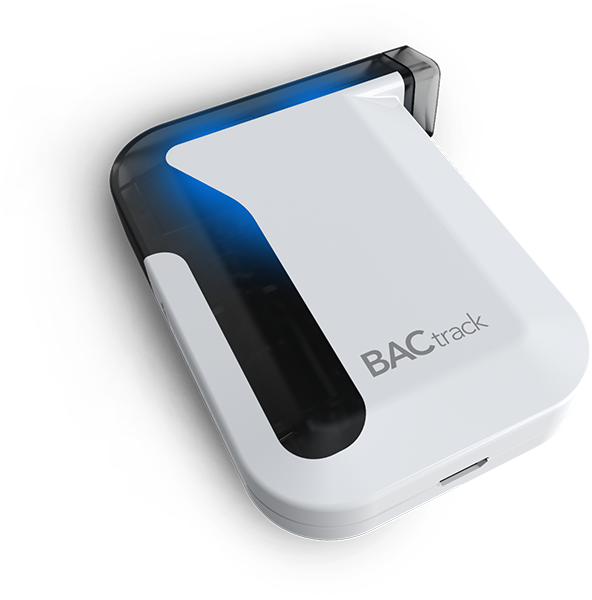 The award-winning BACtrack Mobile Pro integrates a smartphone app and professional-grade breathalyzer to bring blood alcohol content (BAC) wirelessly to your device. Quickly and easily estimate your BAC, track your results over time, and with ZeroLine®, estimate when your BAC will return to 0.00%. You can even call an Uber™ directly from the BACtrack App if you've had too much. Features Bluetooth connectivity, innovative tracking, personalization, and Apple Health integration tools. Ideal for both personal and professional use. Xtend® Fuel Cell Sensor - The same professional-grade technology trusted by hospitals, clinics, and law enforcement, and offers the highest level of accuracy and consistency. Bluetooth Connectivity - Wirelessly connects to your smartphone via Bluetooth. Compatible with most Apple, Samsung, and Google devices. See full list here. ZeroLine® Technology - Estimates when your BAC will return to 0.00%, empowering you to make smarter decisions while drinking. BACtrack Companion App - The free BACtrack app saves and tracks BAC results over time and can even help you call an Uber if you've had too much. The only smartphone breathalyzer that employs professional-grade Xtend® Fuel Cell Sensors, the same advanced technology trusted by hospitals, businesses, schools, and even law enforcement. BACtrack Mobile Pro is equipped with a miniature breath capture pump to ensure reliable and consistent results. You can actually feel the pump activate at the end of every test. Breath into the BACtrack and results are sent wirelessly to your iOS or Android device. Decide what comes next. Save your number? Test someone else? Switch to water? Hand over your keys? Gives you the opportunity, before you test, to guess your BAC level. Compare your perception to actual numbers, and see whether your guesses get better over time. Allows you to track and attach notes or photos to your results. What you drank and ate, who you were with, and how you felt; personalize results to make more meaningful. Bluetooth enables a simple connection between BACtrack and your device so you don’t have to breathe into your phone, and you can see the app’s prompts and results as you blow. Based on your last reading, BACtrack's patented ZeroLine technology estimates the time until your BAC returns to 0.000%, empowering you to make smarter decisions while drinking. Integrates seamlessly with Apple Health so you can see your total health picture and assess how alcohol may influence factors such as sleep and activity level. Provides the most accurate results because of our sensors: professional-grade Xtend® fuel-cell and reliable MicroCheck sensor technology. Includes washable, disposable mouthpieces to improve accuracy by collecting the highest quality sample, and to allow you to test others safely. Choose what happens to your results. Delete? Track privately? Send as anonymous, randomized data? Share only with a loved one? Post to social media? You choose. We focus on our technology so BACtrack’s pro-grade series consistently outperforms. The linear response of the Pro Series’ Xtend® Fuel Cell Sensor Technology provides precise results over the complete range of alcohol concentrations expected in the breath, from 0.000 to 0.400 % BAC. BACtrack pro-grades can accurately detect trace amounts of alcohol and reliably handle very high BACs. Pro-grade models produce the most consistent and reliable results. For example, they are more likely to show the same test result when someone is tested repeatedly in a very short period of time. This means pro-grade BACtracks easily handle multiple high-frequency tests. Pro-grade models are consistently accurate at higher BAC concentrations. If someone is very intoxicated, for example at 0.22% BAC, these models are more likely to provide an accurate test result as compared to semiconductor models, which are less accurate at higher BAC values. Pro-grade models will not show a false positive due to the presence of acetone, which some semiconductor models misread for someone who is diabetic or on a low calorie diet. Extended sensor life helps pro-grade models maintain accuracy for up to thousands of tests, delivering long-term reliability. Pro-grade BACtrack models offer a faster warm-up time, a benefit when conducting high volume and back-to-back tests. Low power requirements enable up to 1,500 tests on one set of AA batteries. The power of your smartphone unlocks a variety of additional breathalyzer features. See clear and vibrant instructions and results, plus features that raise your drinking IQ.